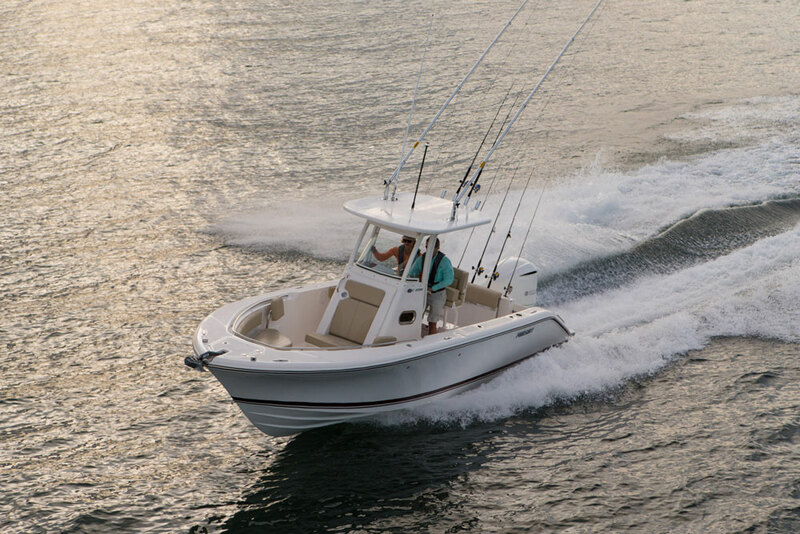 The 2016 Pursuit C 238 center console has got what it takes to fish just about anywhere. 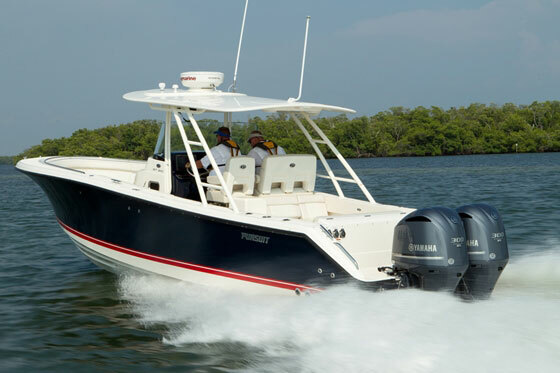 Pursuit Boats has built a huge range of fishing machines, from the brawny OS 385 Offshore express all the way down to the diminutive C 180 center console. And through the years, they’ve also done a great job of keeping their line-up fresh; no boat goes for more than a few years without significant updates and improvements. The latest proof? Their 2016 C 238 center console. The C 238 is the newest and is currently the smallest boat Pursuit is building, and it incorporates 40 changes from the C 230 it replaces. 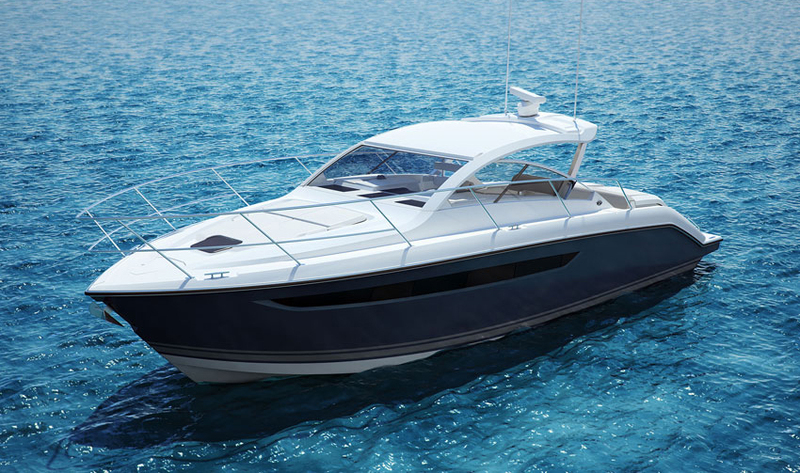 Pursuit calls this boat their “entry level” center console, but IMHO, this boat is anything but entry-level in nature. At 24’4” LOA it has just enough beef to fish just about anywhere, from the northeastern canyons (on a good weather day, of course) to the Floridian Gulf Stream. 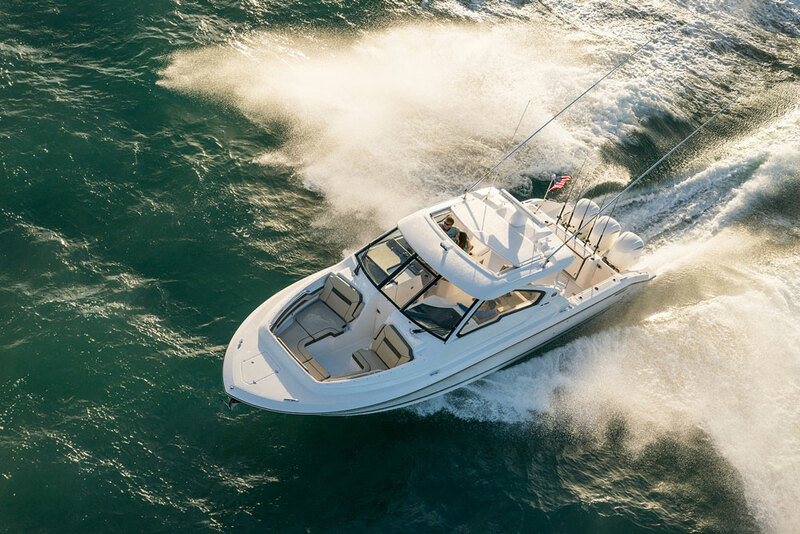 105 gallons of fuel capacity and a single F300 Yahama outboard give it close to 300 miles of range at a 26.1 MPH cruise, and if you throw down the throttle, a top-end approaching 50 MPH. So you can get to the hot bite just about anywhere off the coast. Better yet, you’ll do it in comfort. When I ran this boat through Sarasota Bay the chop was minor-league, but we had plenty of boat wakes to contend with and the C 238 blasted right through them without any significant banging, rattles, or vibrations. The helm seats are an important high-point, with tall backrests, folding arm rests and bolsters, and thick cushions. Dittos for the bow seating, which has swing-away backrests, and for the fold-away transom bench seat. Another comfort-enhancer is the console head compartment, which swings open via a front-opening door with a gas-assist strut. That makes for easy entry, instead of squeezing into a standard (tight, low headroom) side-entry hatch. Once inside, take note of the uber-clean finish and the opening port. So, what of those 40 improvements Pursuit made? Obviously we won’t waste a bunch of time listing out all the little stuff, but there are some major changes to make note of. For starters, the cockpit of this boat is seven inches longer than it was on the previous model. Pursuit’s engineers accomplished this by redesigning the transom, opening up the aft end of the boat significantly. The forward and helm seating and forward console door we mentioned earlier are also new developments. And the hard-top is another big improvement. It’s designed specifically for the also-new console, and is a standard feature on the C238. Another interesting approach Pursuit took to make this a better boat can be seen from behind the leaning post. In the past few years, many builders have taken to mounting coolers on slide-out tracks under the leaning post. The idea is to make cooler access easier, but there are a number of problems with this approach: failing to install a pin can let the cooler slide out unexpectedly, the tracks are a maintenance issue, and even when everything works smoothly, it still adds steps to the simple task of getting into your cooler. 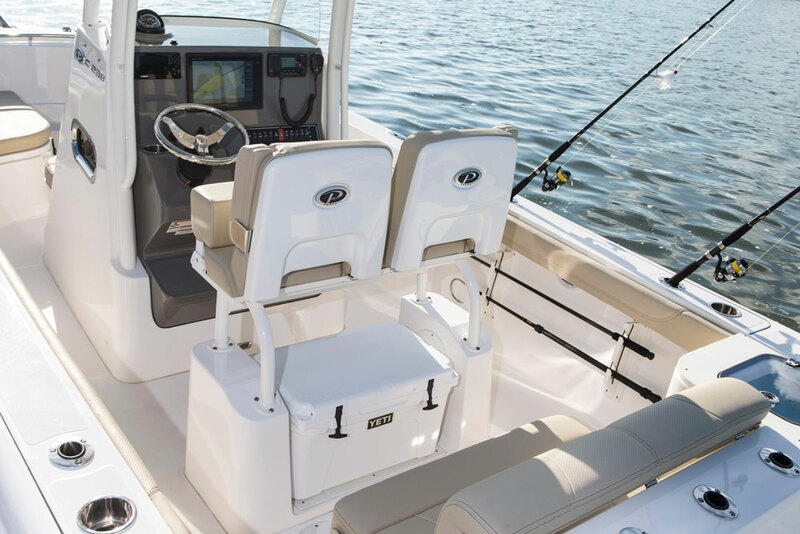 So instead, Pursuit designed a molded-in seat base which elevates the seats themselves high enough to allow unencumbered access to the cooler. No cross-bars are in the way, no sliding is necessary, and you can pop that cooler open any time you like. Eschewing slide-out tracks and eliminating cumbersome cross-bars, Pursuit made the cooler easily accessible from behind the leaning post. Yes, you do lose the area where most manufacturers would build in a couple of tackleboxes, or maybe a bait prep area. Truth be told most anglers bring a portable tacklebox aboard, anyway, but when it comes to rigging baits you’ll probably end up doing it on the cooler lid. 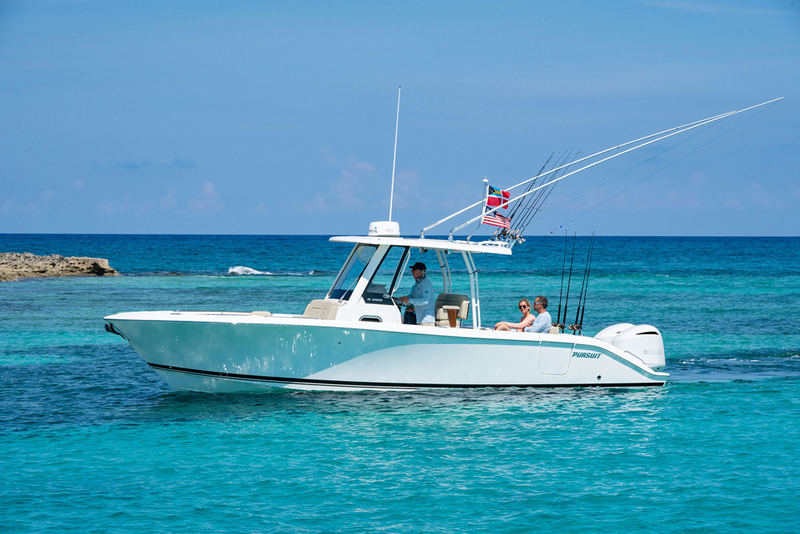 Other fishing features include a 23 gallon livewell in the transom, a raw water washdown with quick-disconnects, under-gunwale rodracks, four flush-mount rodholders, and rocket launchers on the hard top. One other nifty feature you get with this boat is the integrated transom extensions which we first saw on the Pursuit DC 325, and seem to have become a standard addition to new models. 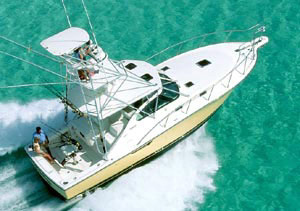 These extensions allow you to walk aft all the way to the back of the outboards, which has two advantages: it makes boarding from the dock a whole lot easier since you don’t have to step over a gunwale, and it makes it possible to reach the propeller on an outboard tilted all the way out of the water. If you’ve ever tried to clear fishing line from a prop or do a complete propeller change while at sea, you’ll appreciate the ability to do so without trying to perch yourself atop the outboard itself. Put all these different features and designs together, and it should be pretty clear that the C 238 is not a re-hash or even what we usually think of as a redesign. This is one new model that truly deserves to be called “new”. 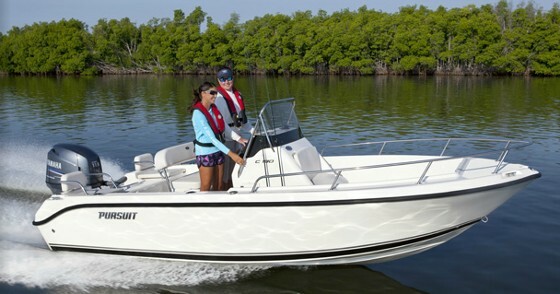 Other Choices: Another high-end center console in this size range is the less fishy but more fancy Chris-Craft Catalina 23. Die-hard anglers will gravitate more towards an option like the Regulator 23. Visit Pursuit for more information. 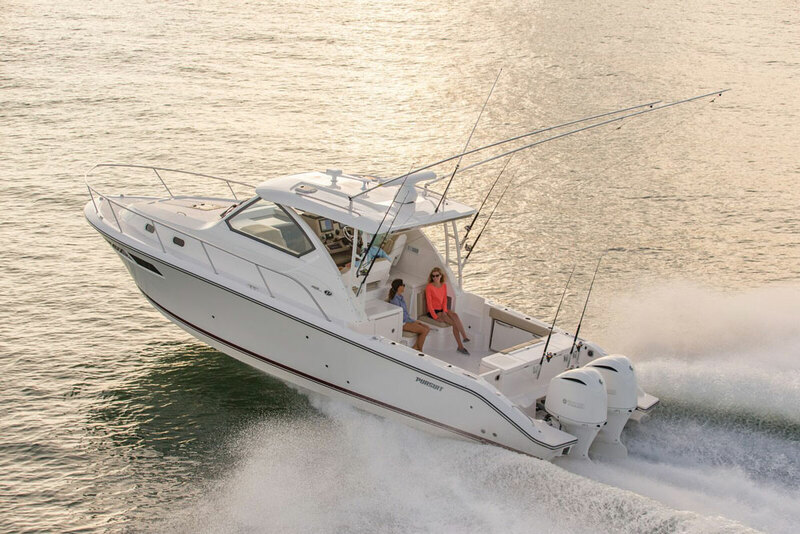 See Pursuit center console listings. Test conditions: 3 POB, full fuel, full water. Performance data courtesy of Yamaha. Power Single Yamaha F300 four-stroke outboard, swinging a 15.5" X 17" stainless-steel propeller.